“Just the Facts, Ma’am: “Testing” Keynesian Theory,” 29 April, 2013. “Believing Is Seeing, Part II,” 29 April. The unrealistic assumption that he appears to be making in his criticisms of me is this: that real output and private investment must have started expanding immediately after the stimulus began. But it is obvious that government spending takes time to induce changes in private investment. Why should there be an immediate and instant movement? I know of no Keynesian economist who has ever thought that there should be instant effects on private investment from stimulus. With reference to the graph of US private-sector investment Murphy posts, I do not find it surprising that private investment continued to contract in 2008 and early in 2009. The shocks to business confidence were very severe indeed in 2008: probably worse than in any other recession after 1945. But private sector investment did turn around in mid-2009: after 6 months or so of stimulus spending, which stabilised demand for products. There is a clear trend of rising private sector investment with rising government spending for years after mid-2009. If private sector investment had continued to contract for years after the stimulus, then Murphy would have empirical evidence to support his anti-Keynesian, Austrian case. But that is not what the data show. L. Randall Wray is interviewed here on the basics of Modern Monetary Theory (MMT) in terms of its theory of the origins of money and the state. N.B. There should be a Part 2 of this interview, but I am unable to find it. Hayek’s mature arguments for his ideal system revolve around the notion of a “spontaneous order” in the free market, which in turn echoes Smith’s “invisible hand.” Supposedly, the market results in a “spontaneous” emergence of order that is opposed to conscious planning or deliberate design. Hayek also invoked a type of evolutionary process in his belief that “spontaneous order” is at the heart of a market process (for a critique of this aspect of Hayek’s thought, see Hodgson 1991). As I have shown in the previous post, Hayek’s “spontaneous order” concept is really an example of an “emergent property,” but Hayek missed an important aspect of emergent properties: that they can be the result of conscious direction and design, not just spontaneity (Lewis 2012: 374). “... the theory of self-organizing systems distinguishes two types of processes implied by non-linear dynamics … : self regulating processes (negative feedback) and temporarily self-amplifying processes (positive feedback). The former stabilizes given states of order. The latter can destabilize an existent state of order beyond a critical threshold and induce a transition to a new state of order. (In the transition between the old and the new state of order, an instability is passed, a phenomenon called phase transition in physics. )” (Witt 2012: 126). Witt regards the processes induced by “innovation competition” as destabilising, and part of Schumpeter’s vision of the “creative destruction” side of capitalism. Witt sees another aspect of Hayek’s defence of the market order as involving an “epistemic argumentation in support of market liberalism.” This is the familiar idea of the market coordinating dispersed knowledge, above all, by the price system. This relates to “economically relevant technological knowledge” such as new production techniques, new goods, and new resources (Witt 2012: 125–126). The process by which innovation affects an economy can result in serious destabilising forces. A further problem from “innovation competition” could be “negative externalities” resulting from new technologies in terms of health or environmental side effects. Witt considers the case of chlorofluorocarbons (CFCs), which were a chemical innovation and one which had a severe negative externality in form of stratospheric ozone layer depletion (Witt 2012: 132). Interventions to deal with this were necessary, and the whole general problem suggests that government interventions can and should deal with negative externalities. In short, Hayek has failed to consider negative and destabilising aspects of emergent market processes. Hodgson, G. M. 1991. “Hayek’s Theory of Cultural Evolution: An Evaluation in the Light of Vanberg’s Critique,” Economics and Philosophy 7: 67–82. Witt, U. 2013. “Competition as an Ambiguous Discovery Procedure: A Reappraisal of Hayek’s Epistemic Market Liberalism,” Economics and Philosophy 29: 121–138. Lewis (2012) is an interesting study of how two of Hayek’s most important ideas – (1) spontaneous order and (2) his theory of the human mind – are examples of emergent properties, even though Hayek failed to properly recognise the latter idea (although the statement in Hayek 1967: 26 comes close). An emergent property can be said to be a phenomenon of an aggregate in which the units of the aggregate have complex interactions producing a novel property not displayed by any unit in isolation and possibly not deducible from the behaviour or nature of individual units. While the emergent property is causally dependent on the existence of lower level elements, it is also caused by the relational state or interactions of those lower level elements. An aggregate or whole entity possessing an emergent property can be called a “higher-level entity” (Lewis 2012: 369). It is clear that emergent properties are important in the natural sciences (Anderson 1972) and in the social world. Hayek’s theory of mind was presented in The Sensory Order: An Inquiry into the Foundations of Theoretical Psychology (1952). Here Hayek recognised that the brain is composed of neurons and their firings, and complex neural networks. Hayek’s argues that external stimuli are classified and generated into a type of “sensory order” by the brain as a “structured entity.” This process is produced by the whole “structured entity” and cannot be reduced to the behaviour of individual neurons (Lewis 2012: 371). Therefore Hayek’s “sensory order” is an emergent property. As for the notion of spontaneous order, Hayek sees the rules of property, contract, tort law, profit and loss and the price system as helping to produce an order in economic life that can be understood as an emergent property (Lewis 2012: 373). In other words, people and their relational interactions under a complex institutional system are both necessary to explain spontaneous order (Lewis 2012: 373–374). Lewis also points out that, strictly speaking, Hayek’s “spontaneous order” notion and the idea of an “emergent property” are distinct, since Hayek neglects “directed social order or organisation” (institutions), which can also produce “emergent properties” (Lewis 2012: 374). For example, the level of “productivity facilitated by the division of labour within a firm” is not merely spontaneous, but directed. Hayek’s “spontaneous order” concept is flawed, in that many elements of market order are caused by deliberate, conscious direction and design, not spontaneity (Lewis 2012: 374). Another crucial idea related to “emergent properties” is “downward causation.” A higher-level emergent entity can influence, shape and direct lower-level entities (Lewis 2012: 375). For example, social rules can shape how people interact, and cause the “habits and dispositions” under which people behave (Lewis 2012: 375). Lewis argues that in fact “Hayek is committed, if only implicitly, to the view that higher-level emergent phenomena possess the emergent causal power to react back on and shape the parts from which they are formed” (Lewis 2012: 376). That is to say, Hayek is committed to a methodology and ontological view of the world (including the social world) that contains not only individuals, but also social relations and entities with “macro-level emergent [sc. downwards] causal powers” (Lewis 2012: 377). “Hodgson on Methodological Individualism,” April 3, 2013. Anderson, P. W. 1972. “More is Different: Broken Symmetry and the Nature of the Hierarchical Structure of Science,” Science 177.4047: 393–396. Hayek, F. A. von. 1952. The Sensory Order: An Inquiry into the Foundations of Theoretical Psychology. Routledge, London. (2) the revolution in automation and robotics, and the return of manufacturing to the West from East Asia. In brief, a report from the International Energy Agency (IEA) predicts that, with domestic oil production soaring, the US will possibly become the largest oil producer in the world by 2020, and by 2035 it could become virtually energy independent. That also means that the US trade deficit will fall significantly. The cheap energy will also feed into and reinforce the second factor above: the return and invigoration of domestic manufacturing, which will be effected by the increasingly cheap and effective forms of industrial automation, especially robotics. There should be some return of manufacturing to the US and Western nations from East Asia and other developing, low wage countries, as production costs – above all, labour costs – fall significantly. If cost of production differences are not great, why not produce in the huge consumer markets of North America and Europe? A third related issue is what this means for the rise of China. It was always nonsensical to suppose that superpower status has no relation to economic power. And the US’s status as the world’s superpower will be strongly reinforced, not weakened, by the emergence of energy independence and the return of manufacturing. It has got to the point now that the idea that China is somehow destined to be the world’s new superpower is assumed by many people when discussing this issue. The RMB is touted as soon to be the world’s new reserve currency, and so on. But there is no inevitability about any of this, and there are many reasons to be rather sceptical. For one, how can China be a superpower with a domestic currency functioning as a reserve currency when its financial and real asset markets are severely closed off to outside investors? Why hold RMBs, if you do not have a wide range of assets to buy with them, in order to get a return, and to repatriate your money quickly and easily? The strength of the US is precisely its relatively free and vast financial and real asset markets that provide resting places for savings held in US dollars. And here is the paradox: if China allows a highly liberalised capital account, liberalised asset markets, and deregulated finance sector, it could be digging its own grave, for the tight control of these things is actually the foundation of its economic stability. In trying its hand at superpower status, a country like China could be setting itself up as new “lost decade” Japan. “... in the late 1980s, Japan entered economic crisis for reasons of its own. Deregulation of the Japanese capital asset markets set off what was, and would remain until the NASDAQ, the largest speculative bubble in human history, combining speculation in stocks and speculation in real estate to an astonishing degree. Valuations in both became wholly unhinged. At the peak of the bubble, it was notoriously suggested that the Imperial Palace in Tokyo was worth more than the entire state of California. Given the demand for Japanese assets, the yen revalued; Japanese manufacturing at the lower end, in textiles and electronics, went into depression and migrated to less expensive shores in China and South Asia. The crash came in 1988, precipitating a deep recession in domestic demand from which the Japanese economy as a whole did not begin to recover for over a decade. This dimmed the luster of the Japanese model for American observers, even as they largely overlooked the obvious point: there is evidently no development path that an unfettered, liberated, free capital asset market cannot screw up.” (Galbraith 2008: 79–80). By “capital asset market,” Galbraith of course means “financial asset market” – that is, the banking and financial sectors and the stock, share, and secondary financial asset markets. First, many Western economists mistook Japan’s industrial policy as some sort of cause of its 1990s lost decade, or at least assumed (falsely) that Japanese industrial policy was discredited because of it. That was profoundly mistaken: it was financial liberalisation and deregulation that were the fundamental causes of the 1990s lost decade. Asset bubbles can be created in virtually any monetary system, but especially when the financial sector is left to do what it likes: just think of Tulip mania, the numerous bubbles of the 19th century (such as the disastrous Australian property bubble of the 1880s), and of course the late 1920s stock market bubble in the US. Secondly, and here is my fundamental point: what Galbraith describes above in Japan is the essence of the rise and fall of neoliberalism over about the past 30 years. Ineffectively regulated financial asset markets cause catastrophe; they always have and probably always will; and one important reason why the post-WWII golden age of capitalism (1946–1970s) had such stability was the proper regulation of the finance sector. When 1980s and 1990s liberalisation of the financial sector occurred in the West, disaster emerged again, just as it did before the 1930s. It was also Thatcher’s UK that was a trailblazer in this respect: Thatcher’s financial deregulation – an important element of which was the Big Bang (1986) – contributed to the so-called Lawson boom (1986–1988), at the centre of which was a debt-financed property bubble. When this collapsed in the late 1980s, a debt deflation ensued in the UK in the early 1990s recession (Stewart 1993: 56–57, 101–102). Japan and Thatcher’s UK were harbingers of the tremendous disasters that occurred later in Clinton’s bubble years and the US real estate bubble in 2000s. Since I intend to examine the subject more closely in the future, I post a critical, extended bibliography below. Agassi, Joseph. 1960. “Methodological Individualism,” The British Journal of Sociology 11.3: 244-270. Boettke, Peter J. (ed.). The Legacy of Friedrich von Hayek (vol. 2). Edward Elgar, Cheltenham. Christainsen, Gregory B. 1994. “Methodological Individualism,” in Peter J. Boettke (ed. ), The Elgar Companion to Austrian Economics. E. Elgar, Aldershot. 11-16. Efaw, Fritz. 1994. “Toward a Critical History of Methodological Individualism,” Review of Radical Political Economics 26.3: 103-110. Hayek, Friedrich A. 1992. “Methodological Individualism,” in Peter G. Klein. The Collected Works of F. A. Hayek. Volume 4. The Fortunes of Liberalism: Essays on Austrian Economics and the Ideal of Freedom. University of Chicago Press, Chicago. 160-161. Heertje, Arnold. 2004. “Schumpeter and Methodological Individualism,” Journal of Evolutionary Economics 14: 153–156. Hodgson, Geoffrey Martin. 1986. “Behind Methodological Individualism,” Cambridge Journal of Economics 10: 211-224. Kincaid, Harold. 2004. “Methodological Individualism and Economics,” in Alain Marciano, John B. Davis and Jochen Runde (eds. ), The Elgar Companion to Economics and Philosophy. Edward Elgar, Cheltenham, U.K. and Northampton, Mass. 299-314. Lachmann, Ludwig, M. 1977. “Methodological Individualism and the Market Economy,” in Ludwig M. Lachmann, Capital, Expectations, and the Market Process: Essays on the Theory of the Market Economy (ed. by Walter E. Grinder). Sheed Andrews and McMeel, Kansas City. Lange-von Kulessa, Juergen. 1997. “Searching for a Methodological Synthesis - Hayek’s Individualism in the Light of Recent Holistic Criticism,” Journal of Economic Methodology 4.2: 267-287. Lukes, Steven. 1968. “Methodological Individualism Reconsidered,” The British Journal of Sociology 19.2: 119-129. McKenna, Edward J. and Diane Zannoni. 1997-1998. “Post Keynesian Economics and the Philosophy of Individualism,” Journal of Post Keynesian Economics 20.2: 235-249. Prychitko, David L. 1999. “Methodological Individualism and the Austrian School: A Note on its Critics,” in Peter J. Boettke (ed.). The Legacy of Friedrich von Hayek (vol. 2). Edward Elgar, Cheltenham. 121-129. Udehn, Lars. 2002a. Methodological Individualism: Background, History, and Meaning. Routledge, New York. Zwirn, Gregor. 2007. “Methodological Individualism or Methodological Atomism: The Case of Friedrich Hayek,” History of Political Economy 39.1: 47-80. Jan Kregel gives a talk below called “China in the World: Growth, Adjustment, and Integration,” given at the Institute for New Economic Thinking’s “Changing of the Guard?” conference held in Hong Kong. The talk from about 27.55 discusses issues of financial regulation, liberalisation, real estate speculation, and the emerging shadow banking system in China and its role in Chinese economic development. One important point brought out is how China’s stimulus after 2008 was implemented via funding from its banking system, something Western nations are not able to do with such lesser control over their financial systems. The short answer is that one cannot predict the price of gold in 1 year, 2 years, 5 years or 10 years with an objective probability score, but the recent crash does not seem to augur well. Presumably, a lot of smug smiles have been wiped off the faces of hordes of goldbugs, along with the value of their asset portfolios! Austrians and libertarians are starting to look like the fools we always suspected they were, with their hyperinflation hysteria and exaggerated predictions about the price of gold. Notice the rout in the graph below. And it is an incredibly steep rout at that! 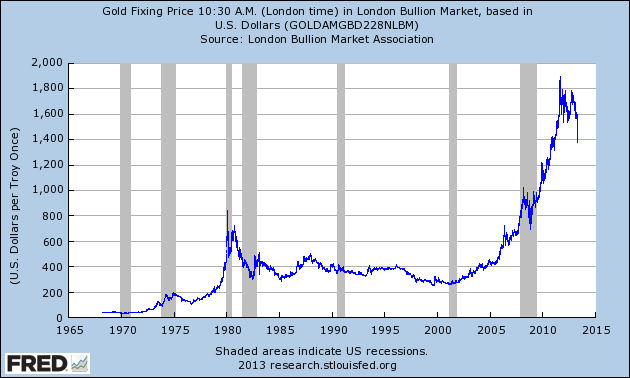 To put things in historical perspective, we can see the long-term price graph from 1968 to 2013 below. 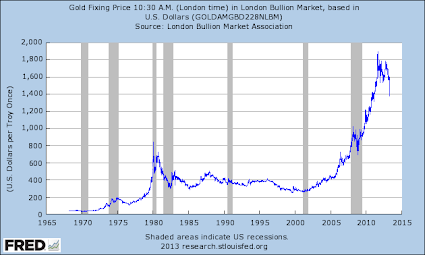 The soaring price after 2008 so obviously looks like a bubble, and the crash, which (admittedly) might or might not continue, may signal that the gold bubble has finally popped, just as the last bubble did in 1980. After the last crash, gold was in a bear market for nearly 20 years. If something like that happens now, many people will be left facing massive losses on their gold. 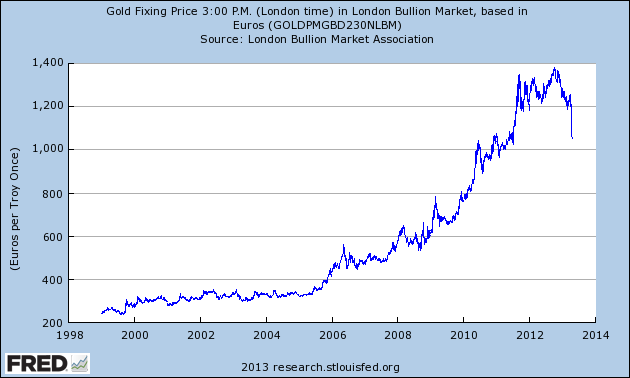 Paul Krugman, Gold Does Not Glitter, April 15, 2013. This is a post that delves into many non-economic subjects, so skip it if you find science and philosophy tedious! The future and the nature of time have a fundamental role to play in economics. I will briefly sketch the Post Keynesian view. In a highly complex system that is open like a human economic system, where specific variables are determined by possibly millions of decentralised decisions, where there is both endogenous and exogenous change, and complex negative and positive feedback, it is the case that fundamental uncertainty will be faced about some specific future values of relevant variables. Fundamental uncertainty means that calculable, objective numeric probabilities are not possible about many specific future values of variables in the system subject to the processes described above (that is, you cannot calculate an objective probability like the a priori probability of rolling a 6 in a fair game of dice for future values of variables). The future is seen as open and not predetermined (Dunn 2008: 106). Human agents have a role in inventing and creating the future by their actions and decisions (Dunn 2008: 106). (4) a future that is not predetermined in an unalterable way, but is created by contingent human action. The notions of time and the future are fundamental. But what does science say about these things? This is the view that only the present – that is, the present instantaneous world – exists. Only the present has real existence. The past and future are unreal. Reality is the three dimensional spatial world with its dynamic time element, or (depending on one’s view) the human perception of it. The Growing block universe theory assumes that only the past and present are real. But the past is “lifeless and inactive” and consciousness and the “flow of time” are only active in the present. To some extent, the Growing block universe appears to be a variant of Presentism. It is also called the “Crystallizing Block Universe” or “Emergent Block Universe” theory. It is obvious that “Presentism” is what seems to be the intuitively correct and commonsensical view of time, although the “Growing block universe” is also compatible, even if somewhat counterintuitive in its belief that the past has a kind of real existence. Certainly, the view of uncertainty in Post Keynesian economics and of the unknowable future seem consistent with, and perhaps necessitate, a “Presentist” or “Growing block universe” view of time: only the present (and possibly the past) exists, and the future does not. The future is created, as time passes. In economic life, human choice has a causal role in shaping one of many possible futures. The trouble is that many mainstream physicists think that the Eternalist view is true. And the issue goes much deeper than just interesting consequences of Einstein’s theories of relativity. Briefly, Einstein showed that the amount of time that elapses for an object is dependent on both its velocity and/or its interaction with gravitational fields. If, for example, one accelerates to close to the speed of light, time slows down (that is, “time dilation” occurs), and one is projected forwards in time relative to other objects travelling at a lower velocity, simply because physical and chemical processes slow down as velocity increases. From this, it follows that absolute Newtonian time is ultimately unreal. Or perhaps what Newton imagined as absolute time can only be strictly limited to spaces and objects with homogenous or near homogenous velocities or gravitational fields. But the mainstream view of time is more radical than these findings from relativity theory, though certainly partly derived from them. What is asserted is this: the universe is thought to be a four-dimensional block or “block universe,” containing everything from the Big Bang to the end of the universe and all things that have ever existed or will ever exist. The forward direction or “arrow” of time is illusory because the whole universe is ultimately static, and if one could view it from “outside,” there is no point anywhere in the universe that can be objectively called the present. Perhaps you think I exaggerate? Just observe the respected physicist Paul Davies proclaim that the flow of time is an illusion (Davies 2002). A strident statement of the same ideas can be found in Julian B. Barbour’s The End of Time: The Next Revolution in Our Understanding of the Universe (New York, 2000). According to these ideas, the universe is ultimately timeless and static. Pushed to its limit, a consequence of this theory is that the “block universe” is eternal and had no actual beginning in time, no subsequent development or growth, and no end, for that would require that there was in fact once a moving present, and would imply “Presentism” or the “Growing block universe” view. If it is true that the universe is eternal, what sense is there in talking of the Big Bang as the causal origin of the universe or of subsequent causal developments and evolution of the universe? Or of an end? Such talk is inaccurate and actually appears unjustified and untrue, if the universe was eternal, timeless and not, strictly speaking, the creation of an unfolding present from a beginning at the Big Bang. Under the Eternalist view, the “block universe” just is, always was, and always will be. Like the traditional god of Western theism, the “block universe” is just eternal and (possibly) uncreated. What does the Eternalist “block universe” theory of reality entail about human consciousness, decision-making and existence? First, it appears to deny free will. How is our vision of an economic future created by conscious human choice that is real and contingent and that could have been different consistent with the “block universe”? It seems utterly inconsistent. The perception of free will and real choice in action are illusions. The future is written already. The second question is this: what is a conscious human mind under the Eternalist view? I digress at length on this point. Our mind appears to be an entity extended in the “block universe.” But the “block universe” is normally thought of as a timeless, static and unchanging entity. How can humans have a conscious perception of a dynamic universe changing in a moving present? “What I want to say is that each of us is a certain spacetime pattern in the block universe. Today, or the day of my birth, or the day of my death—all are equally real, all are different pieces of the block universe. I will never stop living this instant. This instant will never cease to exist; this instant has always existed.” (Rucker 1984: 145). If this were so, then why don’t you have direct access to all past conscious experiences and all future conscious experiences simultaneously in the way you have direct access to the present conscious moment? Or alternatively, why no memories of the future? Another equally strange interpretation of conscious life and the perception of the present in the Eternalist “block universe” theory is the “eternal return” theory: to put it in simple terms, it is the notion that after death you actually experience your life again, and also exactly as it was before, and yet again after another experience of death, and so on and on, ad infinitum. To elaborate, there is an infinite “stream” of conscious “yous” following one upon the other, in every instant of the discrete conscious moments of life, and eternally. As a rough analogy, if each discrete conscious moment of life can be conceived as a frame in a film running in a stream of 1 frames per second, then, if there are 1,000,000 frames to one’s life, it is as if there will always and eternally be 1,000,000 movies playing simultaneously, but each will be running one second out of sync with previous one, with a projection of each and every different frame appearing simultaneously on all screens at any second. The experience we have now is but one of the movies being projected, and it exists simultaneously with all the other movies running at different points in the sequence of frames: that is, a vast number of conscious “yous” experience a moving present at different points. *Or are You (1), You (2) and You (3) all just the same person? If science might confirm – in any sense – the idea of life after death, then this is the only plausible hypothesis ever put forward. If you have a happy and enjoyable life, then you might take solace in such a view. After all, you are eternal! But if your life is not happy and indeed for anyone whose life is unhappy, unfair and involves suffering, most people will complain that it is a most distressing and disturbing theory of existence. I have not seen any detailed treatment of the philosophical and ethical implications of the “eternal return” theory (although my reading is limited), because, if it were true, it seems to have extraordinary implications. But to return to my main point. The problems I identified above do not seem to be resolved by the “eternal return” idea of the perception of one “moving present” amongst an infinitive set of such conscious “presents.” It still does not explain why no one can remember the future or have access to all conscious moments – past, present and future simultaneously. And, above all, how can a dynamic process like an experience of conscious life and moving time be derived from a universe that is timeless and static? An Eternalist “block universe” theory of time seems incompatible with many conceptions of time and the future assumed by economics, and even (curiously) explanations about the origins of physical and biological phenomena and the direction of causality assumed in science itself. I return to the question of how the assumptions of economics and social sciences (and common sense), which appear to assume “Presentism,” are to be reconciled with the “Eternalism” of the natural sciences. (2) the current Eternalist “block universe” theory is wrong. Empirical sciences only ever produce theories that are provisionally true, so perhaps with further future evidence it will emerge that “Presentism” or the “Growing block Universe” theory is true. I will just note that I personally suspect that the “Growing block Universe” theory is the true description of reality. (3) there is of course another most curious escape hatch. If the static universe is unchanging (by definition) and there is no flow of time, then our mental life cannot be caused by evolving physical events in, or emergent properties of, the brain and its processes. In other words, a materialistic/physicalist explanation of the mind as dependent on changing brain states is impossible. Therefore the human mind – and all its mental life including the perception of a flow of time – is explained by some other process, possibly only explicable in terms of dualism or idealism. Matter and mind are separate. Whatever reality we exist in is all in the mind and not causally related to the material world. So all the findings of modern sciences on time are irrelevant. I suppose this might appeal to you, if you are a theist or partial to idealism! Alternatively, if our mental life is caused by dynamic physical events in and emergent properties of the brain and its parts, this suggests that a static, timeless universe is not a true description of reality. At this point, one might be tempted to throw up one’s arms, and admit that one needs a degree in physics and years of research to have anything worthwhile and informed to say about such problems. If one wants to defend a “Growing block Universe” view, then perhaps a satisfactory resolution can be found in this theory, because it assumes a real flow of time and a future that does not yet exist. Finally, I post a video below with a talk by the cosmologist George Ellis defending the “Crystallizing Block Universe” theory (his version of the “Growing block Universe” or “Emergent Block Universe” view of time). I will just note how from 4.30 he describes something that strikes me as remarkably consistent with the Post Keynesian vision of the economic and social world. George Ellis asserts that at the macro level of the universe with its complex systems (that is, neither quantum nor micro levels of reality) it is remarkable how limited precise scientific prediction is: even the natural sciences cannot precisely predict the past or future from present and past data for many complex macro level phenomena. From 11.25 onwards, we get a most interesting example of this: the structure and disposition of current galaxies was causally dependent on quantum fluctuations after the Big Bang. But even if one knew everything about those quantum fluctuations, science could not predict the details of the current structure of the universe. See also Ellis and Rothman (2010) for a defense of the “Crystallizing Block Universe” theory. I add another video below by the Cambridge philosopher Huw Price on the block universe. Barbour, Julian B. 2000. The End of Time: The Next Revolution in Our Understanding of the Universe. Oxford University Press, New York. Callender, Craig. 2010. “Is Time an Illusion?,” Scientific American 302.6: 58–65. Davies, Paul. 2002. “That Mysterious Flow,” Scientific American 287.3: 40–47. Dunn, Stephen P. 2008. The ‘Uncertain’ Foundations of Post Keynesian economics: Essays in Exploration. Routledge, London and New York. Ellis, George F. R. and Tony Rothman. 2010. “Time and Spacetime: The Crystallizing Block Universe,” International Journal of Theoretical Physics 49.5: 988-1003. Maudlin, Tim. 2009. The Metaphysics within Physics. Oxford University Press, Oxford. Maudlin, Tim. 2012. Philosophy of Physics: Space and Time. Princeton University Press, Princeton, N.J.
Rucker, Rudy von Bitter. 1984. The Fourth Dimension: A Guided Tour of the Higher Universes. Houghton Mifflin, Boston, Ma. Sukys, Paul. 1999. Lifting the Scientific Veil: Science Appreciation for the Nonscientist. Rowman & Littlefield, Lanham, MD. It seems widely accepted today that Say’s role in formulating the law is overrated. That is, both Thweatt (1979: 92–93) and Baumol (2003: 46) conclude that Adam Smith was in fact the real father of what is recognisably Say’s law in Classical economics, with the major work in developing the idea conducted by James Mill (1808), not necessarily Jean-Baptiste Say himself. Why is Say’s law false? “For, after all, money is but the agent of the transfer of values. Its whole utility has consisted in conveying to your hands the value of the commodities, which your customer has sold, for the purpose of buying again from you; and the very next purchase you make, it will again convey to a third person the value of the products you may have sold to others.” (Say 1821a: 164–165). This is made clear to us by Say’s statement: “[sc. the] whole utility [sc. of money] has consisted in conveying to your hands the value of the commodities.” This is a world where nobody holds money for significant periods of time because money can have no utility, except in what it can purchase in terms of commodities. But that is not the world we live in. We live in a world of uncertainty. In the face of uncertainty, money can yield direct utility (Graziani 2003: 11). Therefore people can and do hold money for significant periods! First, “Say’s Identity” simply ignores the reality of people holding money without purchasing goods and services because of uncertainty (Keynes’s precautionary motive), or what Keynes called idle money hoards. It also ignores the spending of money on secondary financial or real asset markets or holding of money idle for this reason (Keynes’s speculative motive). In any real world economy, money from income streams from production, either to capitalists or workers, can become diverted to asset markets and may not be spent on goods. For this reason alone, Say’s law is a grossly unrealistic picture of market economies. Capitalists themselves have subjective expectations about the future and the future profitability of investment, and when their expectations are shattered, they will not necessarily invest out of retained earnings. Secondly, “Say’s Equality” already admits the possibility of general gluts. Lastly, as a matter of historical interest, eventually it appears that Jean-Baptiste Say actually repudiated the strong form of Say’s law we call “Say’s Identity” in his letters to Malthus. I also reproduce my extended bibliography on Say’s law below. Say, Jean Baptiste. 1821a. A Treatise on Political Economy, or, The Production, Distribution, and Consumption of Wealth (trans. from 4th edn by C.R. Prinsep). Longman, Hurst, Rees, Orne And Brown, London. Say, J. B. 1821b. Letters to Mr. Malthus: On Several Subjects of Political Economy, and on the Cause of the General Stagnation of Commerce. To Which is added A Catechism of Political Economy, Sherwood, Neely, and Jones, London. Richard Werner, “The Quantity Theory of Credit,” 30 October. One has to scroll down in the link to the 6th talk to listen to the MP3 and see the slides. Towards the end of the talk, there are some inventive solutions to the Eurozone crisis. Also, Victoria Chick points to this discussion of the nature of money here. The critical discussion that follows is also insightful.